Instant buzz monitoring of the competition from content analysis experts Connexor. The web is awash these days with infoglut and navigating through reams of data to find true business intelligence can be likened to a modern day treasure hunt. Often we believe we have the time and resource to make sense of the data but in reality, we have reached a time of sophistication where less has been forsaken in favour of more. Bloated feature sets and complicated metrics characterise the tools we depend on to give us insight into how our companies and brands are performing and as a result, we become less efficient. If you, as a business professional, need an immediate, accurate and time-saving solution to monitor the sentiment around your brand then look no further than Brandfight. BrandFight by Connexor is a free browser-based app that enables marketers, publishers and businesspeople to compare their brands against a competitor. The user interface could not be more intuitive. Once the two brands keywords are submitted, Brandfight’s powerful engines crawl the web for positive and negative news stories about the two brands and present the results in an easy-to-understand one-page summary. The summary enables you to see at a glance which company is faring better - both in terms of who is generating more buzz and whether this buzz is actually positive or negative. 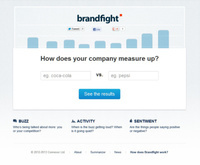 Brandfight’s ability to discern between positive and negative sentiment is jaw-droppingly accurate. The algorithms powering the app are a result of over 20 years worth of research and development in the areas of linguistics, IT and computer science by one of the world’s leading content analysis and linguistic technology providers-Connexor. Traditionally, an enterprise and custom solution provider Connexor has established itself firmly as an authority in the field with a client list that includes Microsoft, SAS, Toshiba, Nokia, General Electric and Pearson Education. Connexor’s state of the art text analysis technology powering Brandfight uses a range of text analyses, including morphological analysis, syntactic analysis, event detection, topic detection and sentiment detection. These methods are combined to extract higher-level metadata which ensures that the topic of the text is indeed the brands in question. From there, the application then determines which pieces of text are positive and which are negative. Brandfight is now available to try in public beta mode here. No sign-up is required.